The games approach allows players to learn the game through enjoyable learning activities featuring gamelike practices that create realistic situations through which they can develop baseball sense. This game gives catchers practice in retrieving wild pitches, pitchers chances to cover home plate, and base runners opportunities to be aggressive and try to score. View a drill from Play Ball. 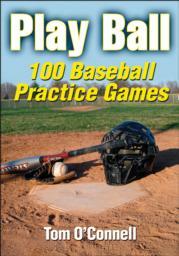 Play Ball: 100 Baseball Practice Games is the best way to develop players’ skills, execution, and on-field team play! With more than 100 skill-building competitions, Play Ball: 100 Baseball Practice Games covers everything from the fundamentals of fielding, pitching, catching, and hitting to special situations such as rundowns, base stealing, and bunting. You’ll even learn how to incorporate the games into team practices to perfect execution and prepare for opponents. Renowned coach and American Baseball Coaches Association Hall of Fame member Tom O’Connell includes games for individual players as well as group competitions for infielders, outfielders, and pitchers and catchers. Coaching tips and variations also allow the developmental games to be used with beginning, intermediate, and advanced players and teams alike.